The Museums and Collections of the University of Melbourne are an immensely valuable resource for students and academics across a range of disciplines. The Grainger Museum, like the other museums and collections across campus, frequently provides access to collections for specific teaching purposes, as can be seen on the Museum’s Education page. Recently, students in Chinese 5 (CHIN10017) had the opportunity to view and discuss a selection of the Chinese material in the Grainger Museum collection. 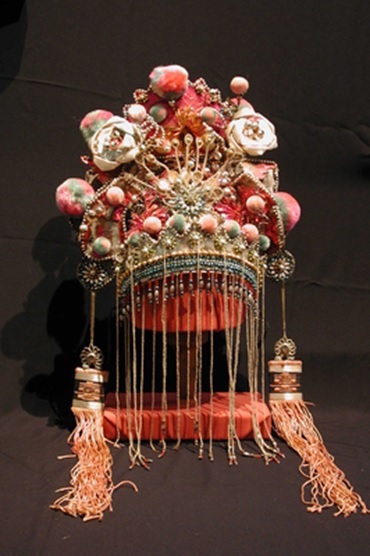 These Chinese objects range from domestic goods and costume, through to musical instruments. Students examined a beautiful silk embroidered jacket, for example, that belonged to Rose Grainger, made in the early 20th century. The excellent condition of this garment suggests it may never have been worn by Rose, and was probably acquired as an ornamental piece, as was an elaborate headdress also in the Collection.